Who knew that best way to teach young musicians about pitch center and tuning was going to be to find great tuning progressions that not only served as an educational tool to teach pitch awareness but also could be enjoyable to listen to and even downright exciting. For decades Wayne's brass sections have been known for their incredible musical Warm Ups both on and off the field (let's not forget the "Parking Lot" before shows). 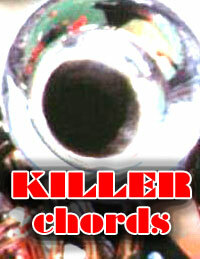 "Killer Chords" is another example of another mind blowing BD-like chord progression that will bring you to your knees on the final chord. From the opening chordal progression the energy never subsides, always growing in intensity until the point of it's glorious resolution. Educational performance qualities developed include but aren't limited to: Individual pitch and tone center, sectional tuning, octave tuning, harmonic balance, tonal blend, ensemble cohesiveness, harmonic rhythm and expression. An enjoyable performance experience that can be as educationally valuable as you could ever imagine. This arrangement can also be found in the "XtremeMarching & Playing Technique" bundle.